Andy Warhol eat your heart out - who needs Marilyn Monroe? Definitely our favourite design from Jolly Red. 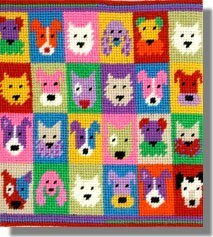 Pop Art Puppies is a 'must have' for any dog lover. The design can be made into a cushion or folded in half to make a spectacle (or mobile phone) case. The kit is worked on 12hpi canvas and measures 7" (18cm) square.